Free of: sugar, salt, starch, yeast, wheat, gluten, corn, soy, egg, milk or preservatives. Other Ingredients: Gelatin (capsule) and Magnesium Stearate and Stearic Acid. 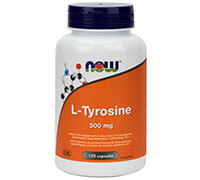 The L-Tyrosine used in this product is Pharmaceutical (USP) Grade.